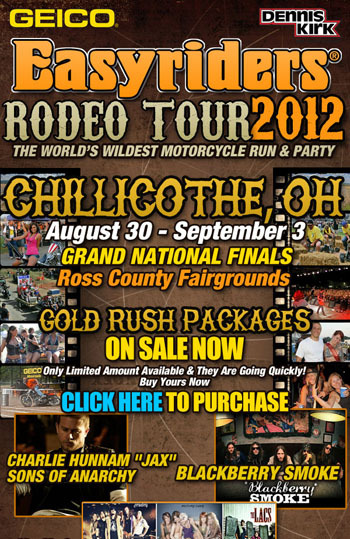 For more information visit EasyRiderEvents.com or click to image below to view the full resolution flyer. UPDATE: The event runs from August 30th to September 3rd, but thanks to the Easyrider Events Facebook Page we can now confirm Charlie will be there on September 1st ONLY. According to the official press release SpoilerTV posted earlier today, it seems our favorite cast is going to be at this years 2012 San Diego Comic Con! Thanks to the The Hub Entertainment Destination Facebook page, we now know the updated times for Charlie’s appearance tomorrow at Sickies Garage Burgers and Brews Grand Opening. Charlie will be at Sickies Garage from 7-9 p.m.! After that, he’ll be hosting the “Leather and Lace Party” in The Venue! This is all happening tomorrow, June 9th! Charlie To Make Guest Appearance at Sickies Garage Burgers and Brews Grand Opening! Charlie is scheduled to appear at Sickies Garage Burgers and Brews June 9th! FARGO – Sickies Garage Burgers and Brews, a 1950s and ’60s garage-themed restaurant and bar, is slated to open June 7 in the former Bottle Barn Liquor store location at The Hub entertainment complex, 2525 9th Ave. S.
The business shares the Sickies Garage name with an established clothing line and is also borrowing its feeling and theme as well. The atmosphere won’t be reminiscent of the 1950s style shown on the “Happy Days” television program, said Kerry Fernholz of Starmark Hospitality. Its look will be a little edgier, with a retro feel. The quick-serve menu will feature cooked-to-order burgers and other sandwiches and 1950s-themed items, such as malts. Sickies will be one of the first bars or restaurants in the area to feature draft beer table taps. Tables will be equipped with four taps. A server will take the initial order and will then load a certain amount of beer for the table. Customers will be able to refill their glasses from the taps as they’re ready. Servers will check back periodically, but the advantage is that customers won’t have to wait for the server for refills. Specific marketing and events are planned to attract car enthusiasts. Fernholz said events such as car and hot rod shows and drive-in theater nights during which movies are projected on an exterior wall are planned. Proposed outdoor events will feature beer gardens, picnic areas, bands and carhop-type service from waitresses on roller skates. Celebrity appearances are planned at grand opening events on June 8 and 9. Lee Rocker of The Stray Cats will appear June 8.